Want to fix error; WDF_VIOLATION in Windows 10? In today’s post, you will read about all the possible ways on how to troubleshoot the issue? From the day, the Windows 10 operating system was first available for the user’s different users complaining about different BSOD Errors. I have got emails from three-four users looking for a possible solution to troubleshoot the famous BSOD Error; WDF_VIOLATION in Windows 10. This post is dedicated to all those users, but before you start reading about the possible solution why don’t you learn a little about this BSOD Error. WDPF in WDF_VIOLATION error message stands for Windows Driver Framework. This explains that the system found an issue in a framework based driver. The chances are high that the system is showing this BSOD Error due to faulty hardware. BSOD Errors are scary especially for those users who don’t have much technical knowledge. 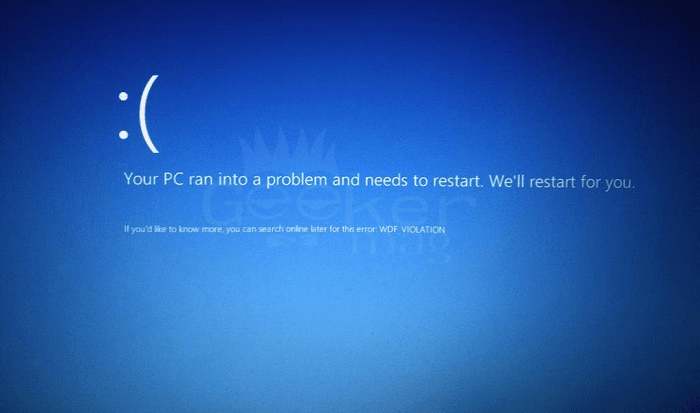 The good thing is like other Windows 10 BSOD Errors users can quickly troubleshoot the issue. In upcoming lines, you will read about effective methods to troubleshoot and fix WDF_VIOLATION in Windows 10. As the error is associated with Windows Driver Framework, the chances are high that outdated drivers may be causing the issue. In this situation, it is recommended to update all the drivers. You can search for particular drivers on the official website of OEM of the system. Navigate to Device Manager -> Select Particular Driver and from the context menu select Update Drivers. This will start searching for the latest drivers, and if the system finds any, it will automatically download and install it. Launch Settings -> Update & Security -> Windows Update. Here check if there is any driver update available. There are lots of freeware tools available that you can use to download and install the latest driver. You can try Driver Pack Solution. Once you have updated drivers chances are high that you will not see WDF_VIOLATION in Windows 10 again. If this fails to fix the issue, try the next method. Some users suggested that they fixed Windows 10 WDF_VIOLATION error by disconnecting all the USB Peripherals. All most of the users reported that USB Camera was causing the issue for their PC. So try to disconnect all the USB Peripherals and find out what causes the problem. If this method failed to fix the issue, try out the next method. Some users also shared that they just fixed the issue by booting the system into safe mode and later performing a simple reboot. Launch Settings app -> Updates & Security -> Recovery -> Reset This PC. And follow the instructions suggested to do. Now check if this fixes the issues. In case all the methods fail to fix the issue, then last resort is to perform a clean installation of Windows 10. So these are possible troubleshooting method which you can use. No doubt WDF_VIOLATION BSOD Error is a problematic and annoying error, but chances are high that any of the method discussed above will fix the same BSOD Error.